Every airplane has a life story. 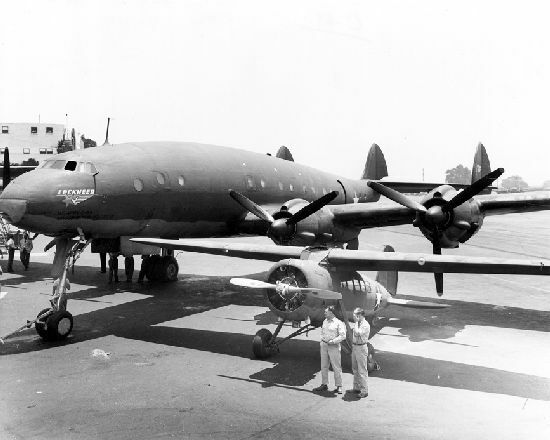 G-AHEL started life on Lockheed’s Burbank production line in 1944, as just the 17th C-69 laid down – constructor’s number 049-1977 and slated to become USAAF 42-94556. 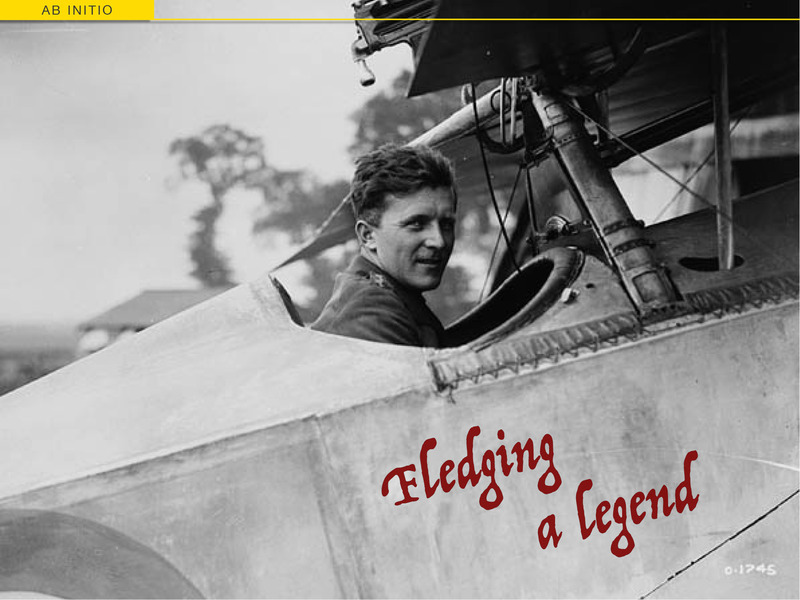 The end of World War 2 saw all C-69 orders cancelled, but Lockheed shrewdly recognised that a blossoming airline industry would be hungry for the orphans. 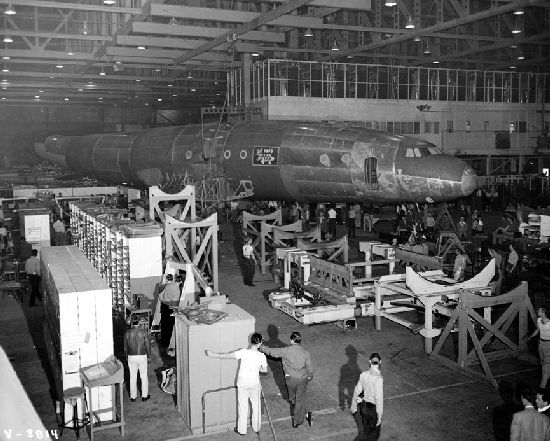 The unfinished C-69s would be completed to the Constellation’s original L-049 airliner standard with the inclusion of extra portholes, a galley and crew rest area, extra insulation and sound proofing, improved ventilation, civilianised R-3350 motors and luxury seating. In addition, seven C-69’s were bought back from the USAAF and later converted to L-049s. In addition, BOAC later took up c/n 049-1971, a true C-69 conversion that had been delivered to the USAAF as 42-94550 on August 4th, 1945. 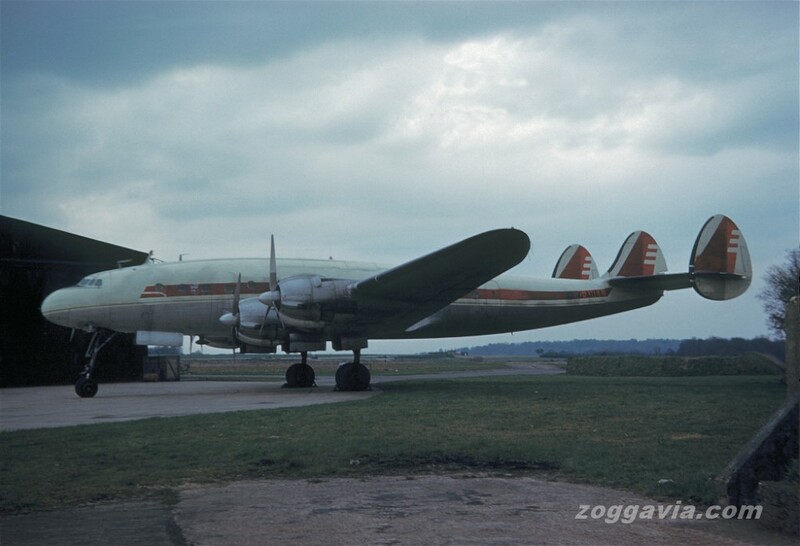 This sixth BOAC L-049 would become G-AKCE ‘Bedford’, serving with the airline from April 1948. 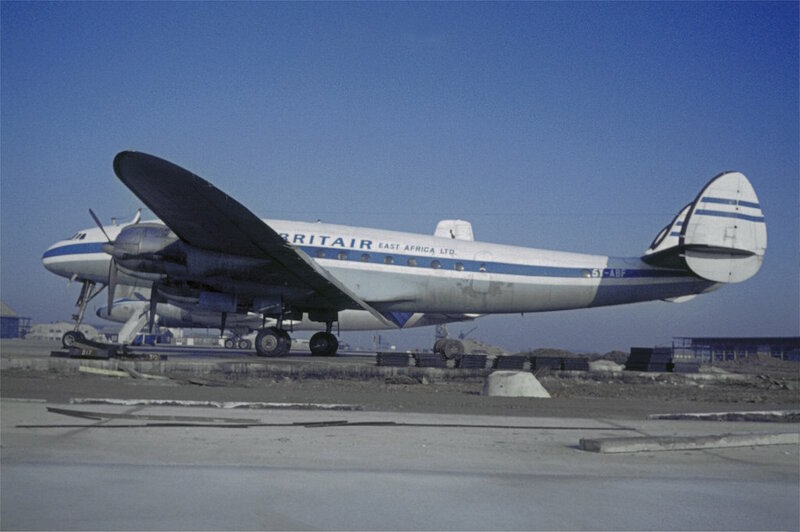 When 049-1977 was rolled out of the Burbank factory she was given the temporary civilian registration N90604 and flown to New York for completion as an airliner before being re-registered to BOAC as G-AHEL on April 6th, 1946. 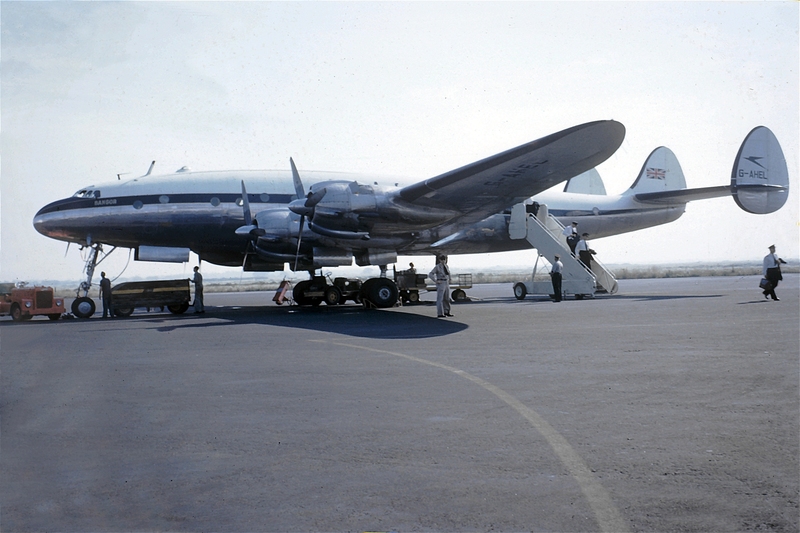 If you’ve read Constellation Crossing, you’ll know Bangor II was undertaking proving flights between Heathrow and La Guardia by June 23rd, 1946, and BOAC began its scheduled Constellation services with Bristol II on July 1st. Bangor II was tailored to market demands with a number of upgrades during her 9 years with BOAC – to a 65-seat all-tourist cabin during 1952 (arguably not an ‘upgrade’); to 049D standard by October 1952; and to 049E in July 1953. But for all that the L-049s were still something of a stop-gap, and operators were clamouring for the improved and standardised L-649/L-749 ‘Gold Seal’ Constellations offering extra range through greater fuel capacity and improved Wright R-3350 Cyclones, as well as numerous other enhancements. 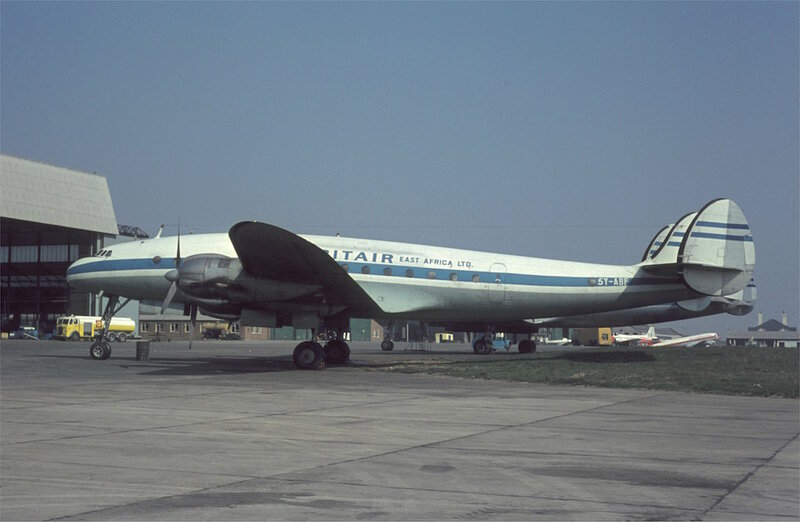 Washington DC-based Capital Airlines had secured a number of L-749 production slots, and in 1954 BOAC negotiated to take over these aircraft as urgently needed capacity replacements after the De Havilland Comet disasters, and sell their L-049s to the struggling Capital one by one during 1955. Bangor II was the first to go. She was sold back across the Atlantic on January 28th, 1955 and was soon re-registered as N2736S in Capital’s bold red livery. However Capital was in a downward spiral of labour disputes and struggling revenues and ‘merged’ with United Airlines in July 1960. So by December 1960, 049-1977 was in storage. Then, in March 1961, she was sold to Falcon Airways of Britain. Flown back across the Atlantic via Gander to Falcon’s base at Hurn, UK, she was re-assigned her G-AHEL call-sign. While Falcon intended to use the Connie for charter work, they had no sooner put 049-1977 into service than they sold her to Trans-European Airways (not to be confused with the later Trans-European Airways / TEA of Belgium) on August 13th, 1961. With regulators breathing down Falcon’s neck over safety concerns, our aircraft only flew with the airline until August 1961 before Trans-European had her brought ‘up to code’ and repainted in their blue colours. Falcon Airways collapsed in September 1961. 049-1977 flew charter flights to Mediterranean resorts and West Berlin with her new owners – and several of her ex-BOAC sisters – for the next couple of years, but was again in storage by January 1963. 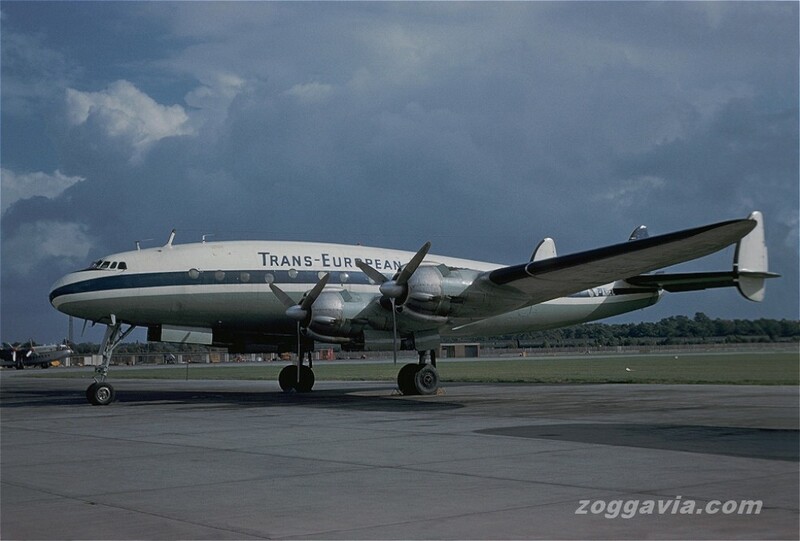 On May 23rd, 1963, she was sold to yet another tour charter operator, Euravia, along with a familiar stablemate, c/n 049-1980 G-AHEN (also ex-Trans European). By now, the airliner was entering her twilight years. In November 1964 she was sold to Britair East Africa, a new airline being set up by-Falcon Airways’ founder Captain Marian Kozubski. 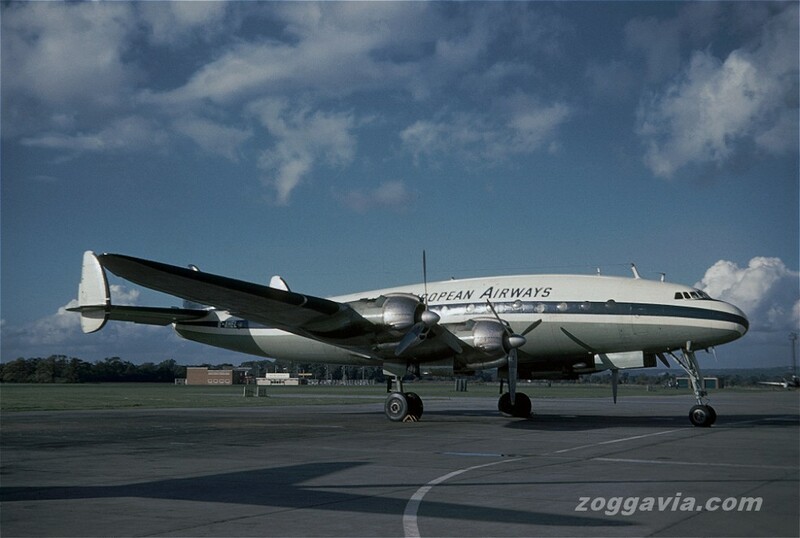 Now bearing the Kenyan registration 5Y-ABF our Constellation began flying a three-weekly charter service (subject to demand) between Rotterdam, Nairobi and Mombasa via Malta, starting on December 20th, 1964. The Constellations had been widely eclipsed by jet airliners at this stage – the 707, 720, 727, revised Comet and Trident were all now in service – but the image of our big propliner thundering over the Sahara is still an evocative one. Almost inevitably, Britair soon struggled into failure. 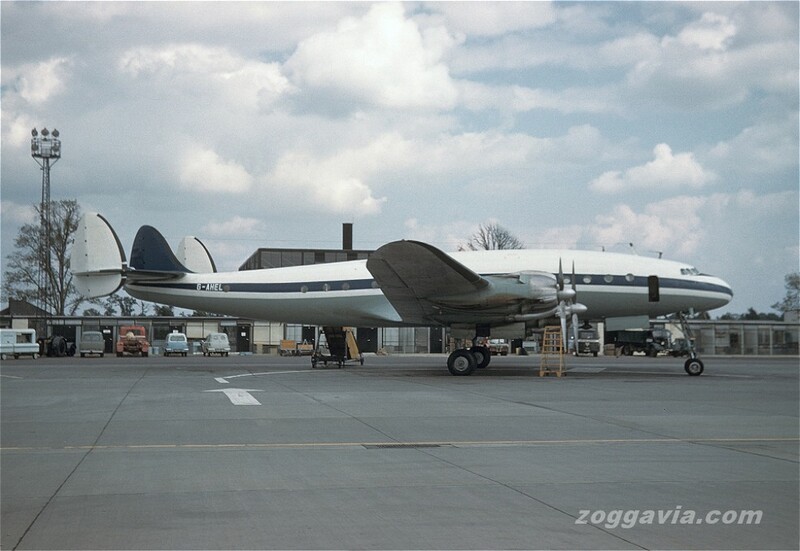 By the summer of 1965, c/n 049-1977 was back in the UK and in storage at Luton Airport. In May 1966 her engines were started one last time and she was flown to Shannon, Eire – her old transatlantic staging port of Rineanna – where she was once again placed in storage. First laid down as a high speed troop transport (“faster than a Japanese Zero” the 1943 publicity ran), then delivered as a glamorous airliner for the new world order, c/n 049-1977 was finally scrapped at Shannon in the summer of 1968. And that’s it. Every airplane has a life story. We should write more of them down. You’re right–we *should* write more of these stories down. For one thing, these were more than just airplanes. They were (and still are) technological marvels, time machines, and works of art. But more than that, they’re important pieces of history now lost to us, and each one seems to have its own unique and interesting story to tell. The story of their journey and of those who built and operated them. It’s the story of Burbank, Lockheed, the war, the development of world air travel, and the rise and fall of countless airlines, charter companies, and enterprises. Thanks for sharing this one. I can’t think of a single word to add to that. Spot on. Thank you. Wow! Thanks for sharing. The investigation results are fascinating. And what a sad end (and I don’t just mean hauling pesticides) for a glamorous airliner. QANTAS engineers used to refer to their L-1049s as “the best three-engined airliners in the world” and kept a string of spare R-3350s spread from Sydney to London. (Not an option on transoceanic flights though.) But yes, having seen it a few times now, the pre-flight procedure for a Constellation is both spectacular and looonnnngggg.